Cast : Patrick Stewart, Jonathan Frakes, F Murray Abraham, Donna Murphy, Mirina Sirtis, Michael Dorn, Brent Spiner, Gates McFadden, Anthony Zerbe, LeVar Burton. Synopsis: When the Enterprise crew arrives to determine the reason behind a malfunctioning Commander Data, they uncover a plan to forcibly relocate a planet’s population in order to harvest a valuable commodity: the elixir of youth. Picard and his crew are all that stands between Starfleet and the annihilation of an entire world. Review : Daring, yet ultimately dull, Trek franchise entry, with Picard going for a romantic-lite journey and discovering a “perfect moment” along the way. Solid direction cannot overcome a sloppy, mixed-messages screenplay, although the cast do their utmost with the material they have been given. F Murray Abraham overacts badly, hamstringing the emotional weight of the conflict at hand. With the success of Star Trek: First Contact, it was only a matter of time before Paramount signed the Next Gen cast up for the inevitable sequel. 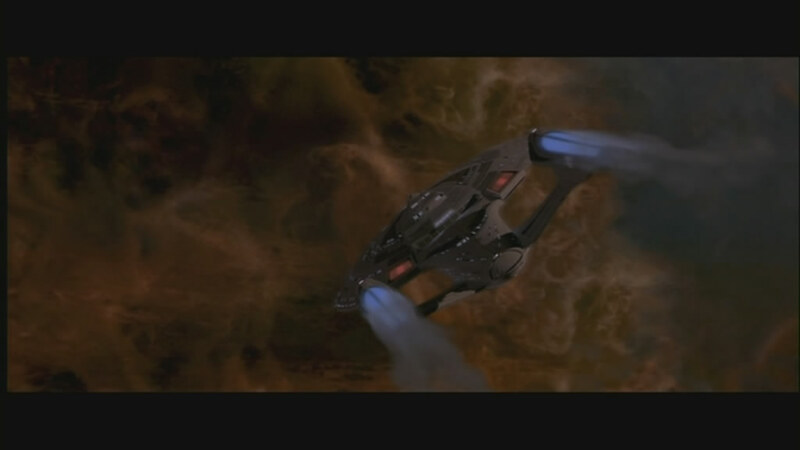 Sure enough, along comes Insurrection, an almost-ran in the Trek pantheon, neither a great Trek film, nor a bad one. It’s a little bit of both. Listen sunshine, just thank your lucky stars I ain’t got Keanu Reeve’s phone number! The film tries to be slightly controversial in nature, the major story-point being the forced relocation of a group of people on a planet that is known for it’s rejuvenation properties: the planet itself is kind of like a fountain of youth. Trouble is, a group of greedy aliens known as the Son’a, want the planet for themselves, and have colluded with Starfleet to relocate the Ba’aku, the native population of the planet, elsewhere. When Commander Data, the Enterprise’s resident artificial life-form, goes haywire on the planet and spoils the Ba’ku’s peaceful existence, the plot begins to unravel. The Enterprise is called in to negotiate with the Ba’ku, although as Captain Picard digs a little deeper, he uncovers a sinister plot that threatens both the Son’a and the Ba’ku. 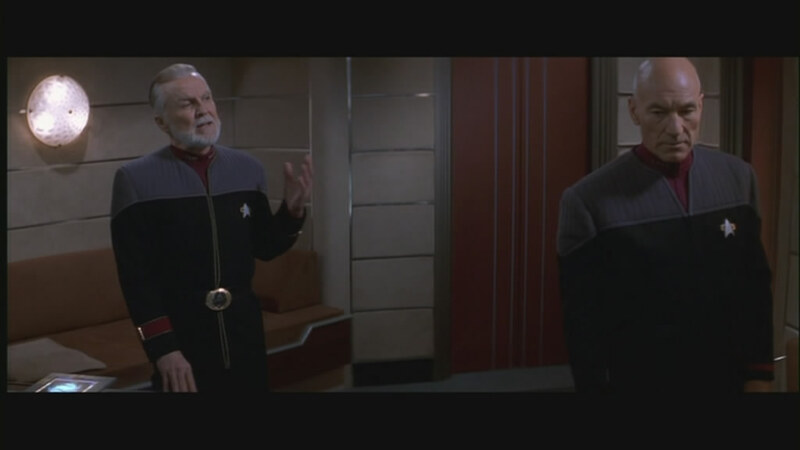 A corrupt Starfleet official, Admiral Dougherty (Anthony Zerbe, who appeared in the Matrix sequels) keeps Picard at distance, until finally the Enterprise crew is forced to go against the orders of their superior officer and leave. 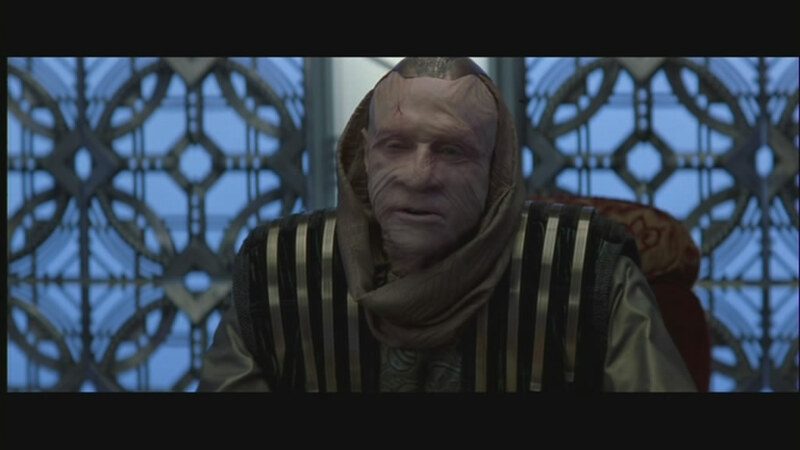 It appears the Son’a are planning on destroying the planet by harvesting the mysterious life-giving particles that surround it, although the plan was to transport the Ba’ku off-world and into a holo-deck version of their community.The leader of the Son’a, Ru’afo (F Murray Abraham, best known for films like Amadeus and The Last Action Hero) is particularly violent and vicious, a fact that Admiral Dougherty doesn’t really take into account, considering he himself wants the secret to immortality as well. With overtones of Naziism and echoes of Australia’s own stolen generation, as well as a sense of corporate greed run amok, Insurrection plays a little like an extended episode of the television series that spawned it, albeit with bigger effects and a stunning surround soundtrack. The plot is weaker than I’d expected, considering the strength of the previous films screenplay (First Contact, which has been reviewed here.) Patrick Stewart, as Picard, has some lovely moments with his romantic lead, Donna Murphy (mother of actress Brittany Murphy, who appeared alongside Eminem in 8 Mile, among other things), who plays Anij, the “mother” figure of the tribe of Ba’ku. His relationship is a slow-burn kind of affair, in typical Picard style, he remains somewhat aloof from his emotions as he slowly falls for, and eventually leaves, the woman and her youthful appearance. The rest of the Enterprise crew struggle to come to terms with the de-aging process they undergo while staying for a period on the planet, with Worf in particular having the best time considering the way he reverts back through the Klingon version of puberty. Now that is hilarious! Generally, though, the film falters when it tries to marry the idyllic, simple ways of the Ba’ku and the nasty, vengeful nature of the Son’a, and Ru’afo in particular. Abraham is a snarling, overplayed villain, never really engendering the sympathy to his cause he would want us as viewers to have: he’s a brutal killer, and will stop at nothing to achieve his goals. This only makes the films twist, in which the ancestry of the Son’a is revealed by Picard at a crucial moment, less impactful than it should have been, and it’s disappointing. The screenplay from Michael Piller, based on a story idea by producer Rick Berman and Piller himself, is a hodgepodge of cool ideas and lacklustre dialogue. Typically, Data and Picard get the lions share of cool dialogue and character development, the rest of the Next Gen crew relegated to set decoration for the majority of the duration. There are moments of bravura storytelling, for sure, but overall, the listless way the film is presented, with undercooked central villains and a mildly predictable plotline, leaves us thinking about what could have been, and wasn’t. Can I lay any blame at the feet of director Jonathan Frakes, who helmed the excellent First Contact? Sure, you kinda have to in this case. Frakes’ insistence on pulling double duty in both directing the film and acting a key role in it too, doesn’t work out for him this time. Frakes’ sense of action and story nous is first rate, however, he simply cannot generate the required enthusiasm in the viewer to care about these people; these people being the Ba’ku and the Son’a. Without the audience’s empathy towards the main plot, the film is lost before it’s begun. There’s nothing instantly off-putting or wrong with the characters of the Ba’ku of Son’a, it’s just that, well, their story isn’t all that interesting. What their story is, though, is a permutation of a lot of aboriginal relocation stories as played out throughout Earth’s long, sad history. The old chestnut where a powerful, rich nation, desires the land of a poor, weaker one, and so invades or takes by force, leaving the displaced race homeless and afraid. The American Indians, the Australian Aboriginies, and even the Jews of 1940’s Europe all suffered the same fate, to some degree. Displaced and murdered, hunted and eliminated, the Ba’ku are a modern parallel to the dangers of acquisition at the expense of humanity. 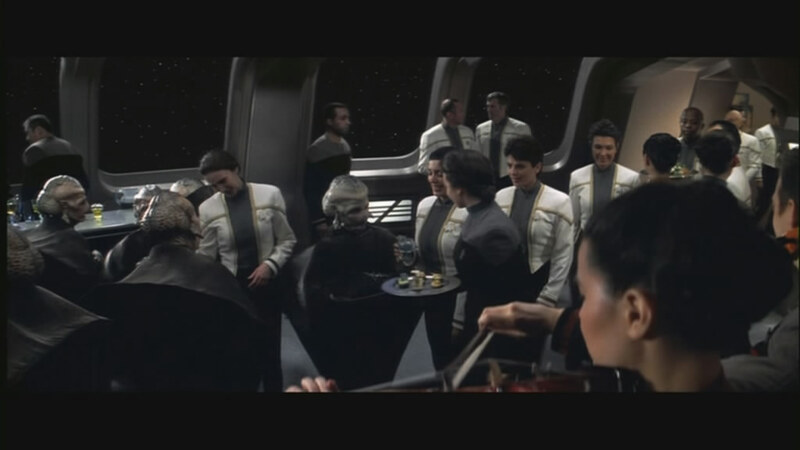 This fact in itself should have been a powerful catalyst for a film to tell a wonderfully emotional story: instead, the Trek mentality takes over to a degree, with calm discussion and stoic heroism in the face of adversity, albeit with the gorgeous soundtrack by Jerry Goldsmith to back it up. Insurrection is an opportunity missed, and I was ultimately let down by a promising premise not taken full advantage of. Technically, the film succeeds enormously; the effects are leaps and bounds ahead of many sci-fi outings, the action and scope of the film is magnificent and well shot by DoP Matt Leonetti, who places the landscape of the Ba’ku home-world (shot in actuality around California) in perfect contrast to the icy cold space-scape of the Son’a ship. The editing is solid, perfunctory, without a hint of risk from Frakes and editor Peter Berger, who also edited The Voyage Home and The Final Frontier back during the franchise’s 80’s moments, as well as a string of minor league fare like Lawmower Man 2, Garfield, Dead Again and Save The Last Dance. Berger edits like a join-the-dots fanatic, allowing the film simply to meander, rather than develop as a piece of drama. The cast performances are great, generally speaking, but the lack of excitement in the editing allows for some lapses in sequence energy that are saved only too late by a magnificent (if all too quick) finale for our central villain. Musically, Jerry Goldsmith again provides a captivating and evocative score, his traditional Trek motifs eschewed in favour of a more ethereal one, with less bombast counterpointing the dramatic action. None of his score for this effort matches past Trek films he’s worked on, but he still stands head and shoulders above many composers who live on today. One of his last film scores, for Star Trek: Nemesis, saw a return to the triumph of Trek music he wrote. Goldsmith will surely be missed. Captain, I canna see where I’m ‘a goin’!! A central conceit that I find a little annoying with Trek is the old “technology comes to the rescue at the last minute” resolution, where our heroes are usually up against it until that faulty phaser gun finally works, or some other piece of technology decides to save the day. Here, the same applies, although the ingenuity employed by Riker and the Enterprise crew is first class: I just can’t help but feel a little let down that our villain is despatched in what I considered to be a fairly non-dramatic way. Of course, the explosive finale is not without some sense of satisfaction, seeing spacecraft explode and shockwaves reverberate across your surround sound system is all well and good, but the dramatic impetus is lost in the most techno-babble-infested way. Ultimately, I thought Insurrection to be a good try at recapturing the First Contact essence, yet still a misfire in some regards. There is a story there that could have been a really powerful one, however the scripting lacked weight and the editing, this time, was stagnant to a certain degree. At least, by comparison with First Contact. You can do a lot worse than Insurrection, a lot worse by a long way, but by comparing it to only Trek films, this is about middle-of-the-road at best. Back To The Future – Told in Rap! !